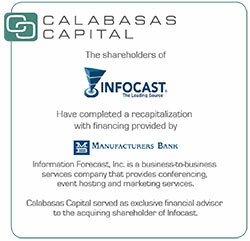 Calabasas Capital is pleased to announce the successful recapitalization of Information Forecast, Inc. (“Infocast”, or the “Company”) on behalf of its client who was the acquiring shareholder in the transaction. Based in Woodland Hills, California, Infocast is a business services company that provides industry-leading conferences, event hosting and marketing services. In addition to the terms and conditions of the acquisition, this transaction involved a number of family law issues that needed to be addressed. Calabasas Capital worked closely with the legal, tax and other advisors on both sides of the transaction to ensure a successful outcome for Mr. Meyer. The advisors all worked in a cohesive manner to complete the acquisition in a manner that was acceptable to all parties. Calabasas Capital was pleased to have had the opportunity to work with Manufacturers Bank who supported the transaction with debt financing and proved to be flexible and very responsive.